When I was a kid, we only had shortbread at Christmas. Mum made shortbread, melting moments, White Christmas and rum balls once a year and we thought they were the bee’s knees. She would make them well before Christmas but we weren’t allowed to eat them unless we had guests and only then if it was a “Christmas visit”. I remember one Christmas Eve, dad invited his friend, Clarry, from work (I am guessing Clarence but dad always called him Clarry) and his wife (I don’t remember her name) for drinks. I suppose the men had a beer and the women had sherry but some time during the evening, out came the biscuits. OMG, I was so excited. There were Christmas biscuits, presents under the tree and the only lights were Christmas lights. It was magical. Mum handed out the biscuits and she didn’t seem to mind how many I took. I couldn’t believe it. I can still remember looking at her, quizzically, and realising, because there were guests, I could eat as many as I liked. I remember when we only had chicken at Christmas and what a treat it was. And then some idiots decided it would be good for the masses to be able to buy cage-reared, hormone-fed, miserable chickens, cheaply. And I remember when cashews and burnt sugared almonds were Christmas delicacies only seen once a year. A lot has changed since then. OK, our standard of living has improved, and I don’t for one second regret that, but when kids can have whatever they want whenever they want, some of the magic of Christmas must have disappeared. We have turkey at Christmas, even if it is just Maus and me. We don’t have turkey any other time of year so as to keep it special. Anyway, there is a shortbread recipe in the cookbook that came with the Magimix. I made it and it wasn’t Christmas. The recipe was dead easy to make and tasted yum so I made it again and that was the end of my resolve only to make shortbread at Christmas time. I have made the recipe quite a few times since. These photos are from the first time I made it. I pressed the dough into a bread stamp. I was amazed how they held their definition. I didn’t refrigerate the dough or do anything special. This time I patted the dough to about 1 cm thick and cut them with a small scone cutter. 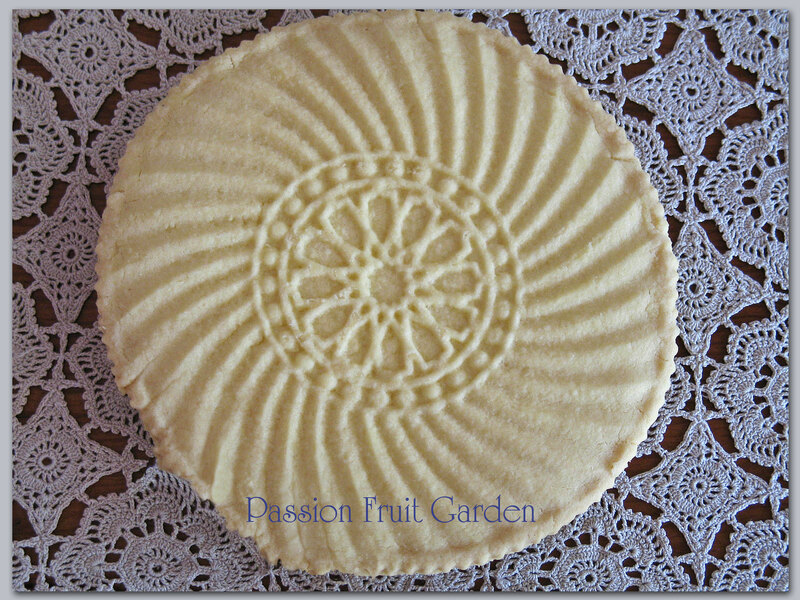 I do have some wonderful shortbread moulds (in Bridgetown) but I am, you guessed it, in Perth! The recipe says to press the dough into a Swiss roll tin. Whatever way you decide to go, you will have some great biscuits from very little effort. Put all the ingredients into the bowl of your food processor and process for 10-15 seconds or until the mixture forms a ball. I found my mixture was too dry so I added some milk, a few drops at a time, until the mixture formed a ball. Chill the dough until firm enough to handle. Press dough into a Swiss roll tin, prick the surface with a fork and cut into fingers or form separate biscuits. If you don’t have any fancy equipment, my mum used to make little balls and then press them down with a fork. If you decide to press the dough into a mould, you may wish to refrigerate your biscuits for about an hour before baking them as it helps the mixture hold the definition – and remember to dust the mould with (preferably, rice) flour. Preheat your oven to 160ºC and bake for about 40 minutes. The biscuits should be slightly golden on their bottom and just colouring on top. This entry was posted in Biscuits & Slices, Sweet Things by Glenda. Bookmark the permalink. This looks delish and easy! It is, thanks for stopping by and commenting. 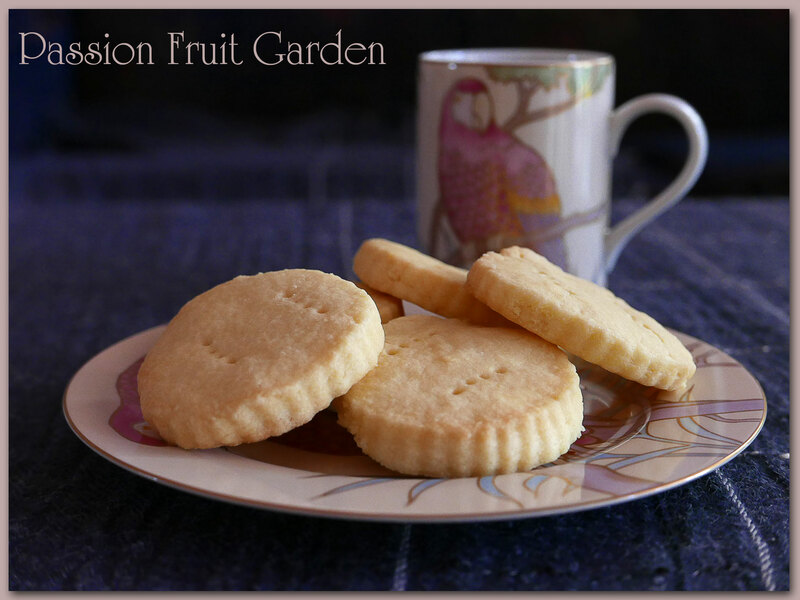 Pingback: Foodprocessor shortbread — Passion Fruit Garden – Guinea Conakry Presidential Election 2020. Wow.. It looks so beautiful and yummy. I loved the pattern..
Hi Elizabeth – do try, it is so easy. Just bought cookie stamps and am awaiting it in the mail shortly. Now I also have a recipe to use. Thank you so much. I hope they turn out perfect four you. Same here. Still waiting. Wish they will arrive. I am itching to try them out. I love shortbread cookies. Your cookies sound amazing. Love using food processor for baking- makes the best pie crust, I have a recipe for one with yogurt! It is so simple. I use my food processors all the time. these look very appetising Glenda!! you could probably also freeze them well, bon appetit! Hi Lara, I am sure you could. Sounds like you have some wonderful memories Glenda. Love the expression bees knees. Your shortbread looks delicious! Hi Cheri You don’t hear “the bees knees” much any more do you? I loved this post, Glenda… the words and the photos. Just gorgeous! ps: Cornflour rather than rice flour… that’s interesting too! Mum always used rice flour but the cornflour works too. I wonder why this recipe holds the mould definition so well. What a delightful story from your childhood. The days of special foods at Christmas are a thing of the past with probably the exception of ham on the bone. Even though shortbread is a Christmas only treat, maybe I could be tempted…. I think we are all best to wait for Christmas. I love your Christmas story and the accompanying values. Shortbread for me also is a Christmas thing because that’s when we ate it, either homemade or from a fancy tin that came in a hamper. It’s getting harder to have just Christmas fare but I try to keep a few items of festive food like homemade custard, fruit in jelly & Madeleines (in lieu of trifle which the G.O. isn’t fond of), old fashioned creamy potato salad with boiled eggs & peas, cold leg of ham (I bake a leg in winter), lychees and cherries for the season. I try and come up with a new Christmas biscuit or cake variation each year. I would have turkey but everyone else prefers chicken, free range of course and I do the same repertoire of cold meats & salads. Without consciously realising it the G.O. has adopted many of my family’s ways, and we look forward to our simple traditions at Christmas, seafood on my birthday (bbq’d), Christmas Eve & Good Friday. Lamb on Australia Day (predates Karl Stefanovic) & Easter Sunday, sausages mash & onion gravy for the G.O.’s birthday. How lovely hearing about your Christmases growing up. Amazing how things have changed through the decades. Shortbread is also a Christmas tradition in our home and I remember my great gran used to make them every year and they were always stored in an old biscuit tin and they were the most heavenly things I had ever eaten. Have a beautiful day Glenda. Glenda the good old days have long passed, which is such a shame. Christmas as a child was always a very exciting time but now it leaves me flat. Way too much commercial stuff. Anyway the Shortbread look lovely – Enjoy. I think Christmas through adult eyes will always be paler than Christmas through a child’s eye. Mum sometimes made fruit mince pies, but not always. 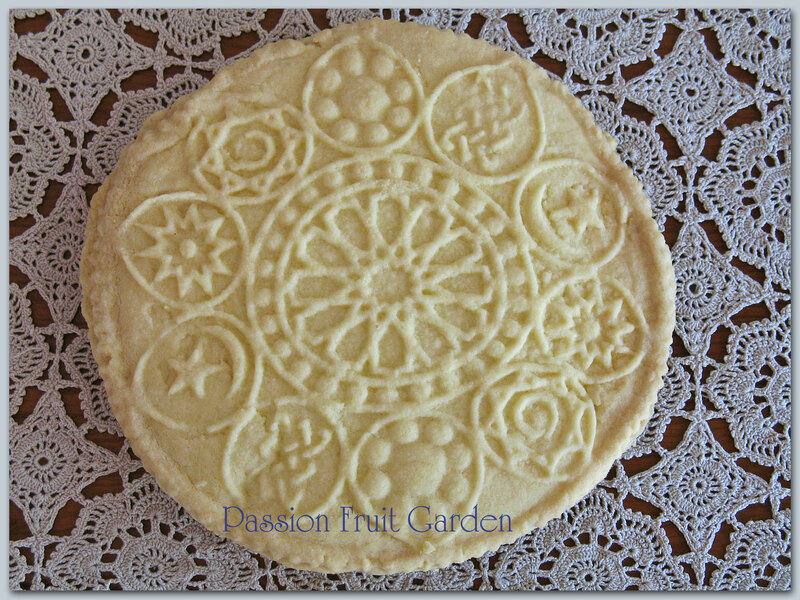 Beautiful shortbread! Yes, I remember Christmas like that. I looked forward to those burnt sugar almonds. Once mum bought the goodies for Christmas they sat high up on the cupboards on display ( and temptation! ) until Christmas or the appropriate time! Thanks for sharing! Hi Marcellina. Thanks for your comment. I was just thinking about the Christmas biscuits. We must have known how precious they were as we never nicked one. Moya, as I mentioned to others, these are cheap plastic bread moulds for making flat breads. The biscuits do look easy but I want the moulds too- making it doubly Christmas. Francesca, those moulds are for making Middle Eastern flat breads. I was just playing when I pressed the shortbread into them. Celia has some too. She uses them as chocolate moulds. I’ll look out for some. They are from a Middle Eastern shop (I think Lebanese) in Sydney that Celia frequents all the time. I am sure she would buy you a couple. They are very cheap. 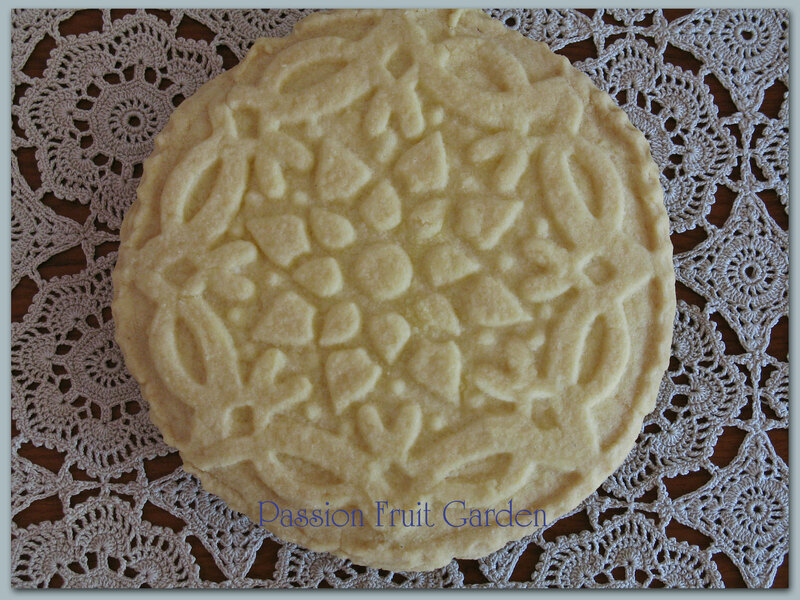 Love the patterns of your shortbread stamps. Or are the moulds? My stamp shapes usually lose a but of definition when baked, although you can still see the patterns. I’ll have to try your recipe to see if there is any difference. I think my recipe has a higher butter content which would account for the slight distortion. Debi, there are bread moulds that I was playing with. I didn’t expect it to work so I didn’t put much effort into the moulding but I will next time. I do have proper shortbread moulds, I just didn’t have access to them with this batch.